Ritchie Shoemaker, M. D., is a recognized leader in patient care, research and education pioneer in the field of biotoxin related illness. While illness acquired following exposure to the interior environment of water-damaged buildings (WDB) comprises the bulk of Shoemaker’s daily practice, other illnesses caused by exposure to biologically produced toxins are quite similar in their “final common pathway.” What this means is that while the illness might begin acutely with exposure to fungi, spirochetes, apicomplexans, dinoflagellates and cyanobacteria, for example, in its chronic form, each of these illnesses has similar symptoms, lab findings, and Visual Contrast Sensitivity findings. Taken together the inflammatory illness from each of these diverse sources is known as a Chronic Inflammatory Response Syndrome. We do not have a blog for Dr. Shoemakers first few shows. He joined us before Cliff started doing a weekly blog. It may take a few time listening to make sense of everything he is proposing. 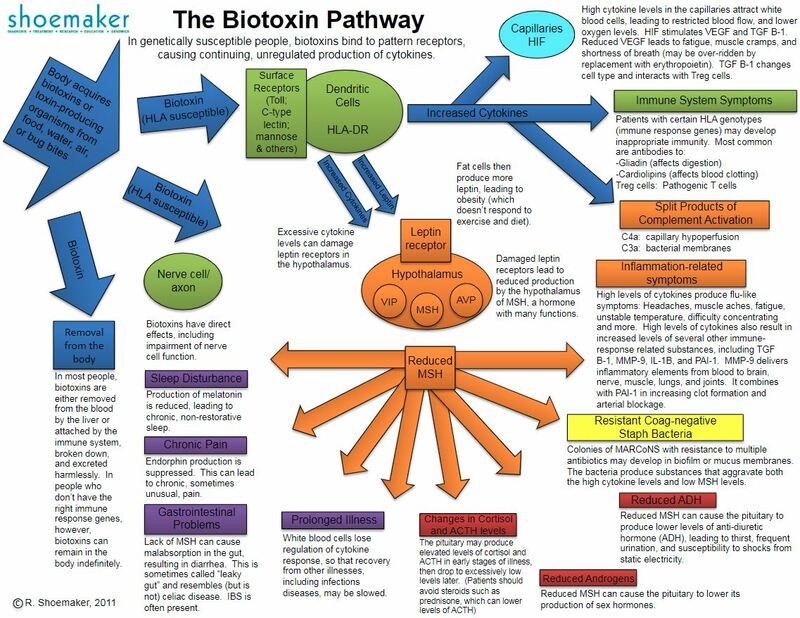 It was very helpful when he sent me the Bio-toxin Pathway chart to follow. Print this out and have it handy while listening to his shows and it will help you immensely. Next week we will send out links to all the other MD shows we have had over the years. Its a gold mine of information on chemical sensitivities, mold sensitivities, allergies, asthma, influenza and more all related to indoor air quality, disaster restoration, building science and home performance.